Mt Norikura is located at the southern end of the Japanese northern alps and there are 23 peaks which are known collectively as Mt Norikura. Its highest peak ‘Kengamine’ is 3026 m above sea level. 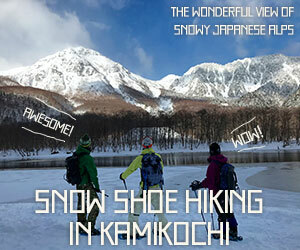 Mt Norikura is said great field for backcountry ski and snowborading by people who loves backcountry. ※Of course Mt Norikura has Avalanche Risk. We should say just relatively low. Avalanche accident is occurred sometime. Therefore you need enough experience, skill, knowledge and equipment. ・Slope is comparatively gradual. Some part is very steep. ・There are guide tour by local experienced outdoor company. We strongly recommend you to participate below guide tour(Japanese and English). There are many activity in Norikura Kogen in winter seaon. Please also check below. Please check the below page for the spring backcountry and summer skiing and snowboarding.